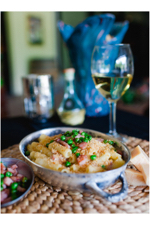 Baked Ziti tossed with home made béchamel, prosciutto cotto and fresh Spring peas. Lee creates a menu that pairs with the wines selected for the evening. Guests are often seated family-style in Trattoria Divina’s conversation-friendly, fresco and fabric-covered spaces, where they truly feel like they are sitting down to the family table, set under an arbor of grapevines and olive trees in the Tuscan countryside. Primo Martedì is Trattoria Davina’s wine tasting on the first Tuesday of every month. 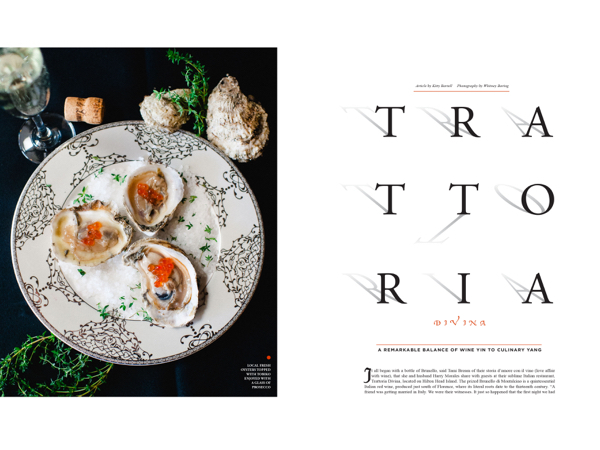 Literally translated “first Tuesday,” the events provide an opportunity for Bream and Morales to share their passion for finding new palette-pleasing varietals. “We usually pick five wines—typically, two whites, then we pair two reds in the middle, and then a big red at the end,” Bream said. “Then Chef does a pairing for the two whites, then a pairing for the two reds, and a pairing for the end. Their love of wine may have been sealed in Italy over a bottle of Brunello, however, today Tami Bream and Harry Morales’s taste in wine skews more toward a MARS vs. VENUS approach: He likes deep, earthy Italian reds; she is all over the place in her tastes, which provides Lee with many reference points for his culinary inspiration, and offers guests a deeply delectable wining and dining experience. “We’re not sommeliers; we’re not aficionados,” Bream said. “We just say we’re kind of dorky about what we like and what we don’t like. We aspire to the name ‘Cork Dork.’ We’re a great balance.” Wow, this is kind of cool. For more information or to make reservations, please call (843) 686-4442 or visit trattoriadivinia.com. 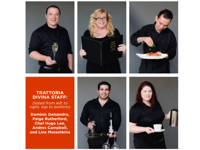 Trattoria Divina is located at 33 Office Park Road, Hilton Head Island. Tip: GPS will not accurately direct you to Trattoria Divina. Look for them in Park Plaza Shopping Center between Harris Teeter and Park Plaza Cinema.